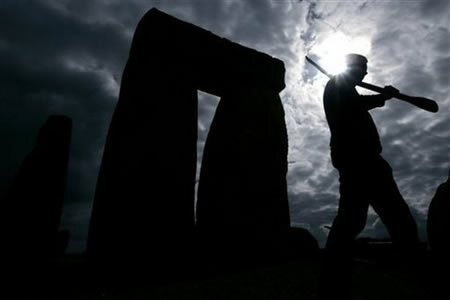 With the permission of English Heritage and a bunch of neo-druids, archaeologists broke ground yesterday on the first archaeological excavation of Stonehenge since 1964. The trench being dug is just 11 feet (3.5 meters) long and 3 feet (1 meter) wide. They’re looking for the foundation holes of the first inner stone circle, and for any kind of organic material to provide more precise dating of the monument. Their theory is that the original bluestones were thought to have curative powers, that the original stone circle was a place people came to be healed. The excavation will uncover the foundations of the original double circle of stones within the earth bank. The bluestones were then rearranged several times when, centuries later, the double-decker bus sized sarsen stones, which do come from the plain, were piled up into the gigantic circle of uprights and lintels which gives the monument its unforgettable outline. It was the bluestones which made Stonehenge a centre for healing, they believe. “A Bronze Age Lourdes,” Wainwright said; “the A&E ward of the south-west,” as Darvill put it. You can follow the progress of the dig on the English Heritage site. New videos of the work will be posted daily.